How do you find unique photographic experiences in a city of 20 million people that now receives over 200 million combined domestic and foreign tourists each year? This was the dilemma I faced when I was recently asked by Cathay Pacific Holidays to lead an exclusive photography trip in Beijing for the discerning members of the Hong Kong Jockey Club. This carnival atmosphere at Badaling is hardly a place to capture a special photograph much less enjoy the supposed serenity of the environment. It’s popular because it is the section of wall nearest the city. 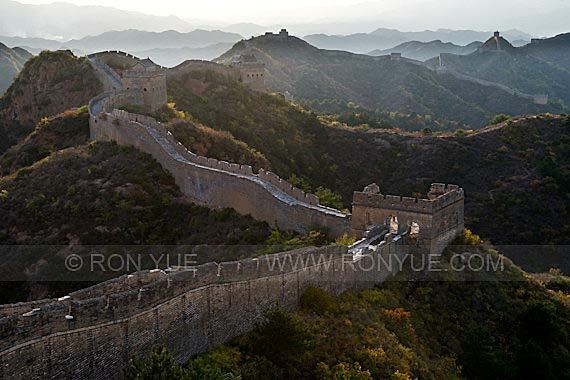 By heading out to other sections of the wall a little further from Beijing, you can easily escape the crowds. The section of wall between Jinshanling and Simatai is remarkably photogenic, and easy to walk up to, yet receives comparatively far fewer visitors. Photographers trek up to the classic viewpoints for sunrise photographs, however, I have discovered that at certain times of year, the sunset view is actually more dramatic (see one of the photos on my homepage slideshow). Not many seem to stay for sunset since they are concerned about getting down off the wall before dark, but I convinced my group that they wouldn’t regret the experience. The ability to avoid the crowds is not only in your ability to choose your locations, but also deciding on what time to visit. On a glorious Sunday afternoon in October with cameras and flashlights in tow for the walk down, we were virtually the only ones on earth up on the wall freely capturing our own unique experiences. There are many other amazing and very wild sections of the wall that I’ve explored, but I’ll leave that up to you to find so that you can uncover your own secrets. This entry was posted in Inspiration, News and Notes, Tales from the field, Travel. Bookmark the permalink.